"41AN1-26, Burial E-4" by Timothy K. Perttula and Robert Z. Selden Jr.
DECORATION: The rim has a panel comprised of four ovals. The ovals are defined by sets of four closely-spaced engraved arcs that extend from upper to lower horizontal engraved lines that encircle the rim. There are four hatched triangular elements on the upper and lower parts of the vertical arcs. Poynor Engraved, var. 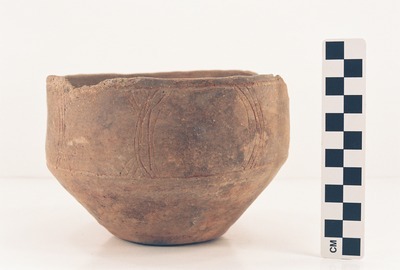 Cook carinated bowl (Vessel 41AN1-26).